Golden (BC), Canada – I really remember just a few snapshots from the collision… a sharp voice shouting from behind me… something big moving from left to right in front of me…and my friend Greg’s hands protecting his face as he watched the spectacle from the passenger seat. It seemed as though we’d tagged the hind quarter of a rather large animal, which careened off the right side of the car and out of sight. Then suddenly, as though the entire episode was simply a concoction of our road-weary minds, we were once again cruising along in the gentle monotony of a dark and deserted Canadian highway. But something was different. My myopic view from the headlights had shifted upward. I realized that our vehicle was slightly awry, and it wasn’t long before my companions, Greg, Chris, and Dave knew it too. Our group was driving north into the Canadian Rockies on a quest for outdoor adventure exploring the massive vertical and prodigious steeps of Canada’s Kicking Horse Mountain Resort. Even though we’d just crossed the border from Montana into British Columbia, it appeared as though our adventures were already well underway. After a few more minutes of driving, we found a pullout and investigated the effects of our chance encounter. In the fading light, I could see that the car had taken quite a hit. The right headlight was all but destroyed, and the associated parking and fog lights were in similar shape. Portions of the hood, side panel, and grill were also damaged; I was astonished. It seemed like we’d barely touched the animal. Fortunately, there was no serious structural damage that would hamper our driving, and amazingly, light was still coming from the bulb in the shattered mess. Like any experienced group of skiers, we were well-armed with a fat roll of duct tape, so I aligned the remains of the headlight, applied a liberal assortment of the silvery strips to hold it in place, and called it good. Soon, we were back on track to Golden, B.C. and Kicking Horse, only slightly worse for wear. The Eagle’s Eye at Kicking Horse Mountain Resort, which boasts the largest vertical drop of any resort in the Canadian Rockies at 4,133 feet. Although it’s British Columbia’s newest ski resort, portions of Kicking Horse have been around since 1986 as part of Whitetooth Ski Hill, which served the Golden area with its 1,740 feet of vertical and two lifts. In 1999, Golden Peaks Resort, Inc. embarked on a dramatic expansion to transform the ski area into a world-class mountain resort, and Kicking Horse was born. With the largest vertical drop of any resort in the Canadian Rockies at 4,133 feet, 2,750 acres of in-bounds terrain and counting, and three huge alpine bowls on the upper mountain, Kicking Horse is on its way to offering a ski experience that will rival anything in the region. But Kicking Horse, as the new kid on the block, has a little something over many of its neighboring resorts: fewer people on the slopes. And let’s not forget what type of slopes we’re talking about. The walls of the resort’s bowls are simply loaded with steep lines, and advanced skiers and riders will have ample opportunity to challenge themselves on numerous slopes exceeding 40 degrees. Big vertical, steep slopes, and small crowds – could it really be that simple? Like many avid skiers, we’d heard the hype about the terrain at Kicking Horse, and relished the opportunity to confirm the rumors for ourselves. Our chance encounter with the Canadian fauna behind us, we cruised smoothly into the town of Golden, a community of roughly 4,500 people nestled a couple thousand feet below the resort in the Columbia River Valley. Golden’s origins lie in the search for a rail route through the Rocky Mountains, and the town site was used by Major A. B. Rogers in the 1880s as a base camp for his crew surveying what is today Rogers Pass. In an effort to outdo a camp to the east which called itself Silver City, the name Golden City was chosen, and ultimately shortened to the name Golden that is used today. 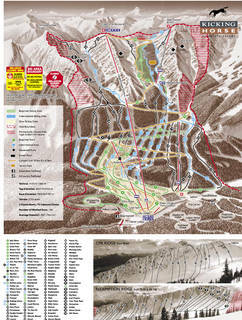 Click image to open a full-size Kicking Horse trail map in a new browser window. 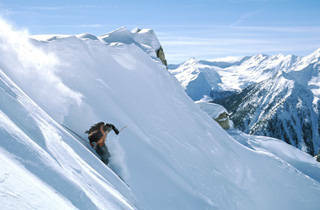 Golden has always made use of its natural resources, whether it was timber, or mountains and snow. Golden is now the gateway to the slopes of Kicking Horse, supplementing the on-mountain facilities with additional dining and lodging options, and providing a place for those who would rather skip the total resort experience for the feel of a real Canadian mountain town. Kicking Horse, the name for the mountain pass to the east of Golden, the river that flows through it, and now the resort, originated in an even earlier expedition in the 1850s. Sir James Hector, a geologist who was part of that expedition, was exploring the pass and was kicked by a horse so hard that he was knocked out cold. Legend has it that he was presumed dead and woke up just in time to avoid being buried alive. His harrowing experience resulted in the establishment of the Kicking Horse name. A sense of quiet grew as we left the outskirts of Golden, crossed a surprisingly long and narrow bridge over the Columbia, and headed up eight miles into the Dogtooth Range of the Purcell Mountains to reach the resort. The clear mountain air and lack of lights enabled the stars to stand out brilliantly… a little too brilliantly in fact. We entered what we thought to be the base village of Kicking Horse, and encountered nothing but total darkness. We didn’t expect a raucous night life in the small collection of buildings that comprise the up-and-coming base village, but total darkness seemed a bit extreme. We drove around in search of the Glacier Lodge, but encountered nothing but the disorienting black silhouettes of numerous buildings. After a few confusing minutes, we felt we had located the lodge, and parked at what we assumed was the main entrance. We were met by Leslie, the concierge, and the one who had the unfortunate job of informing us that the entire village was temporarily without power. Fate seemed to be taking care of the adventure aspects of our trip with little effort on our part. We squeezed our way through the normally automatic, yet currently inoperable front doors, and Leslie guided us by flashlight to our room. By the light of a headlamp or two, we managed to find our beds. We hadn’t yet skied a single turn, but excitement wasn’t in short supply. As I faded off to sleep, I could only wonder what the next day would bring. As dawn broke, our balcony at the Glacier Lodge afforded us a fantastic view of the assortment of slopes laid out above us. First time visitors to Kicking Horse might be a bit alarmed at this sight, as there is no sign of the highly-touted alpine bowls. Trust me, they’re there. What might appear to be an entire ski area’s worth of terrain when viewed from the base area is really just the tip of the iceberg, or perhaps more in tune with the local geology, the tip of the glacier. 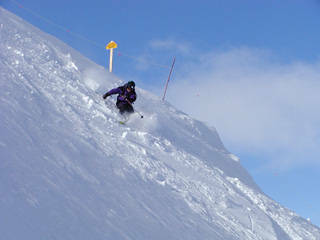 The top half of Kicking Horse is made up of huge bowls filled with steep lines that will challenge any skier. Any concerns about finding big lines will quickly be removed by a ride on the Golden Eagle Express Gondola, which rises a whopping 3,800 vertical feet from the base area to reveal the hidden terrain that crowns the resort. The scale is something you have to get used to if you haven’t skied at similar resorts in the past. Kicking Horse is a lot like two ski resorts stacked on top of each other, the bottom half full of a wide array of trails cut out of the forest, and the top half made up of huge bowls with lines that can challenge any skier. You just throw a couple thousand vertical feet here, a couple thousand vertical feet there, and voila, you’ve got yourself one enormous ski resort. At the top of your ride on the Golden Eagle you’ll come face to face with not only magnificent 360-degree views of the Rocky, Purcell, and Selkirk mountain ranges, but a little something extra – The Eagle’s Eye. Resting atop a rugged ridge at an elevation of 7,700 feet, The Eagle’s Eye is Canada’s highest restaurant. Along with its lofty elevation comes plenty of haute cuisine, including local offerings like buffalo, elk and lamb from Alberta, or salmon and oysters from British Columbia. For those that just can’t get enough of the Eagle’s Eye and really want to live it up, the complex even houses a couple of exclusive suites for overnight guests. An overnight stay in one of the suites includes lift tickets, guaranteed first tracks, a private ski instructor, dinner and breakfast for two, and plenty of additional perks to cover just about any of your ski resort needs. All this luxury comes with a price tag to match, of course, but it really is the ultimate resort experience. We took only a short break to soak in the high-elevation aura of the Eagle’s Eye, because our more immediate goal was to hit the slopes. While the Golden Eagle offers a speedy ascent from the base of the mountain to the upper reaches of the resort, your trip doesn’t have to stop there. The true peak of lift-accessed terrain at Kicking Horse is reached by the Stairway to Heaven Quad Chair, which transports riders to Blue Heaven at an elevation of 8,033 feet. A relatively short trip down through the resort’s central “Crystal Bowl” is all it takes to get from the Eagle’s Eye to the Stairway to Heaven. In fact, despite the hair-raising steeps that are found throughout the alpine bowls, you don’t need to be an expert to enjoy the views from the uppermost lifts at Kicking Horse. Beginner terrain drops right from the Eagle’s Eye, meanders down into Crystal Bowl, and returns to the base area in the form a ten kilometer run known as “It’s a Ten”. Skiers and riders of intermediate ability and above can even descend from Blue Heaven. The gondola and the quad are all you need to know when it comes to riding the lifts in Kicking Horse’s alpine region, the setup is simple and to the point. 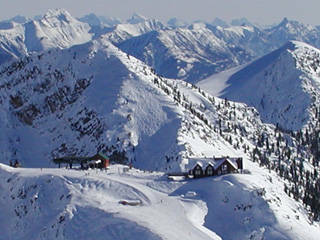 The resort’s three east-facing bowls (Bowl Over, Crystal Bowl, and Feuz Bowl, ordered from south to north) are separated by two long ridges known as CPR Ridge and Redemption Ridge. The gondola and quad deliver you to the upper termini of these two ridges, and voila, you’ve got access to most of the terrain in the three bowls. Naturally, the farther you want to venture away from the lifts, the more traversing you’ll need to do, but you can really get to an impressive amount of steep terrain without having to gain too much vertical. For those individuals who need even more adventure than what Kicking Horse’s lift-served terrain can provide, the resort’s got you covered. Additional in-bounds terrain is available on the far side of Bowl Over, where steep lines with names like Truth, Dare, and Consequences drop off the north side of 7,900-foot Terminator Peak. Presently, the best access to these lines is from the top of the Golden Eagle Express, so some hiking is required to access their full extent. But for those that want to really ramp up their adventure, yet stay on avalanche-controlled terrain, Terminator Peak is waiting for you. Pushing it one notch farther out, there’s the Kicking Horse backcountry. Two more bowls surround the current three, comprising the five that will eventually be part of the resort as it heads to the projected 4,000+ acres. 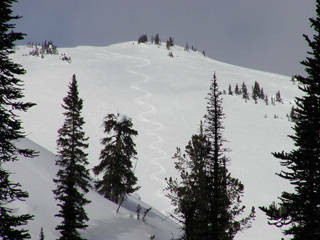 There’s Super Bowl to the south, and Rudi’s Bowl to the north, which are already becoming popular sidecountry additions. Both of these areas offer a quick return to the resort’s trail network, allowing several laps to be done in a day. There’s plenty of accessible terrain out beyond these bowls as well for those that want to make slightly longer trips. If you’re prepared with the appropriate avalanche knowledge and gear, fresh tracks are yours for the taking. Our own travels took us up to Blue Heaven, where we made a short additional climb from the top of the lift to access some north-facing lines down into Feuz Bowl. It had been quite a while since Kicking Horse had seen any new snow, but fortunately the resort’s low traffic and cold temperatures had kept the snow surfaces reasonably soft. There were even pockets of untracked powder around, but skier-packed snow was the general rule. Since the CPR and Redemption ridges run west to east, they typically provide south-facing lines with good light and warmth from the sun, or north-facing shots with optimal snow preservation. None of these steep shots are especially long in terms of vertical drop, with 500-1000 feet being the norm, but you won’t lack for pitch. We found that the north-facing lines tended to offer the steepest rock-lined chutes, while the south-facing terrain tended toward slightly mellower lines among a smattering of trees. While the on-hill experience at Kicking Horse has received many accolades, there are still a few imperfections. The current upper-mountain lift system is quite efficient when viewed in terms of a terrain to lift ratio, but it’s also a source of frustration for some. For those who want to remain on the upper mountain because of its terrain or better snow, their sole option is the Stairway to Heaven chair; it’s a fixed grip quad and it services only a portion of the alpine. Also, while the mountain is well known for having ample terrain to challenge experienced skiers (60% of the terrain is rated advanced and expert), intermediate and novice skiers may find the terrain choices lacking compared to many resorts. The author samples some of Kicking Horse’s steep upper mountain ridges. Solutions to these issues are fortunately on the horizon. A proposed lift would service several new intermediate trails in the lower elevations to the north of the current trail network, and the option is available to install a mid-station on the Golden Eagle gondola that would vastly expand the amount of upper-mountain terrain that could be skied without a return to the base. With a notable difference in snowfall between the base elevation (100 inches) and the summit areas (275 inches) it’s likely that better access to the upper elevation terrain will be quite important in certain years and at certain times of the season. We spent some time exploring the trails on the lower mountain, and while the groomed runs were generally in nice shape, the numerous steep bump runs still lacked full coverage and were only marginally skiable. Some of these snow coverage issues on the lower mountain may be alleviated with the phasing in of snowmaking over the next couple of seasons. Despite less than perfect coverage on the lower slopes of the resort, we encountered fantastic base depths on the upper mountain. The infamous tropical punch storm had come through earlier that season to drop rain on the lower elevations of the resort’s terrain, but the bowls had been absolutely blasted with snow. Thanks to Kicking Horse’s relatively high elevation, its upper mountain areas were enjoying their deepest base depths since the resort’s inception, while some of the lower-elevation ski resorts in the region were bemoaning the torrential rains. For our second day on the slopes, we hooked up with Mike Gash, one of the instructors from the Kicking Horse Snow School. With Mike, we dropped off the cornice along the western edge of Feuz Bowl, an area known as Whitewall. Steep lines abound in this area, and while you may want to take your time at first to get a feel for where the ledges and cliffs are located, you’re likely to find some quality turns. 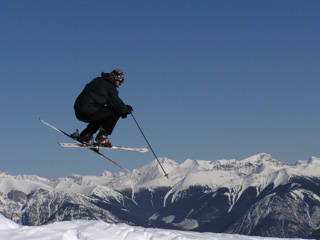 Whitewall should be on the hit list of any expert skier making a trip to Kicking Horse. For a special treat, Mike introduced us to Secret Chute, a steep couloir hidden on the north side of CPR Ridge. The route into the chute is very tight and challenging, and you’ll need to hook up with a local guide to even find it (they don’t call it Secret Chute for nothing). If you do get a chance to visit Secret Chute, follow your guide closely, lest you end up stranded halfway down a cliff. Once you’re through the tough entry, however, the reward of Secret Chute is worth the trip – you’ll get to ski a beautifully-protected, north-facing couloir that sees even fewer skiers than other options in the area. And when you’re talking about the modest crowds of Kicking Horse to begin with, you’re likely to hit some snow that has seen very little traffic. When we were finally able to pull ourselves away from the slopes, we got to spend a little time in the Kicking Horse Village. 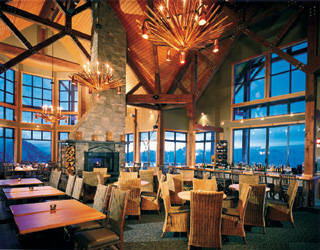 As the resort is still in its infancy, there are only about a half dozen on-mountain dining options at this point. The aforementioned Eagle’s Eye is clearly the flagship offering, but we enjoyed a nice dinner at Corks, which is located in the Copper Horse Lodge and serves bistro-style cuisine. The Glacier Lodge also houses a couple of restaurants, including the new Extreme Peaks, which serves casual fare at the base of the gondola, and Sushi Kuma, an authentic Japanese restaurant. On-mountain lodging continues to expand toward an anticipated 3,500 beds, and there are now several hotel and condominium-style lodges, as well as townhomes, and luxurious single-family style resort homes in the resort’s village area. The resort has been focusing heavily on the real estate development in recent years, and the development of additional lifts and terrain has been relatively slow in comparison. Expansions to the ski terrain appear to be on the drawing board, but there have been no new lifts installed since the Stairway to Heaven, which went in five years ago. At this point, Kicking Horse can’t provide quite the diversity of off-hill activities that you’ll find at some of North America’s largest resorts. However, through the combination of the resort and Golden, guests will have plenty of opportunity to enjoy the traditional winter alternatives like cross-country skiing, snowshoeing, snowmobiling, dog sled rides, snow tubing, and more. Also, for those that would like a little more variety and culture, Banff is just a couple of hours away. 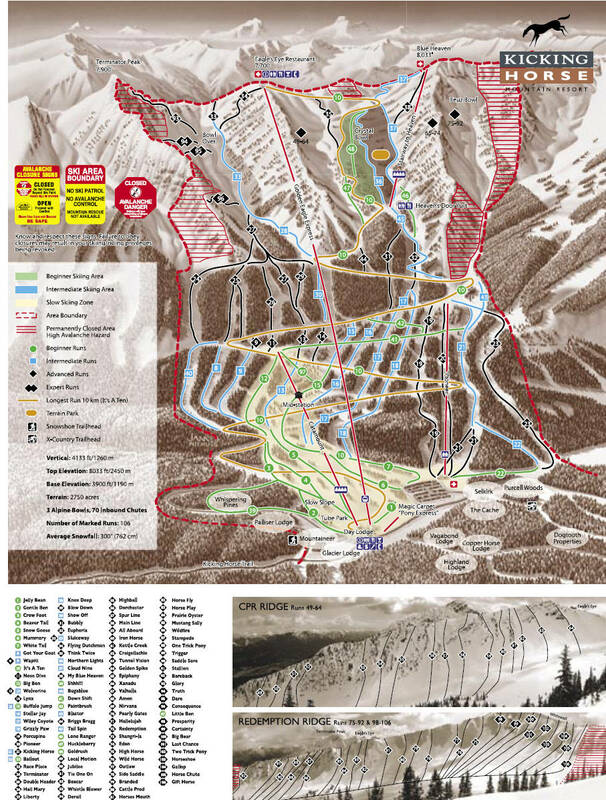 If you’re thinking of doing some helicopter or snowcat skiing, and would like to couple that trip to some more traditional lift-served turns, Kicking Horse is definitely in the right place. The surrounding region is a North American hotbed for these activities, with several outfits to choose from. Join the crew of J&E Productions at Kicking Horse Mountain Resort. The presence of heli skiing in the area was obvious during our trip to Kicking Horse, as we witnessed the dramatic scenes of helicopters flying among the local peaks. Golden is really an outdoor sports Mecca of sorts, so even off-season adventure seekers visiting Kicking Horse will be able to keep themselves busy with whitewater rafting, hiking, mountaineering, hang gliding, and just about any other outdoor activity you can think of. The resort has an extensive mountain biking program that makes use of the gondola from June to October, providing some of the biggest lift-served vertical in North America. They also have a rather unique feature in the form of a grizzly bear refuge that provides summer and fall visitors the chance to see the Kicking Horse grizzly “Boo” in his native habitat. Kicking Horse is certainly a resort for the adventurous, those who want to try something new and those that want to get away from the crowds. Still, vacationers who want to focus on beginner and intermediate terrain might want to wait until these options are more plentiful before committing to an extended trip to the resort. For families looking to explore moderate terrain, recent additions such as daycare, and enhanced summit-to-base cruising terrain already ensure that a visit to Kicking Horse will make an excellent stop on a regional visit. Advanced and expert skiers will find all the terrain they can handle at Kicking Horse, and although it is a large resort, it’s still got to grow to its full potential both on and off the hill. So, while Kicking Horse may not quite yet be the place for everyone’s week long ski trips, adventurous skiers and riders should definitely set their sights on this British Columbia resort. Hopefully you won’t get knocked out cold like Sir James Hector, but you just might garner a little more appreciation for the Kicking Horse.